The shimmer from this sequin-mesh formal dress by PromGirl is irresistible. With a slender cut, the satin-lined evening dress features a sequin-embellished overlay from neckline to hem. The sleeveless bodice has a classic sweetheart neckline and accented shoulder straps that cross against the open back. A bead-embellished band beautifully defines the natural waistline and circles around to secure over the long form-fitting skirt. The skirt flows to a formal floor length and ends with a romantic short train. 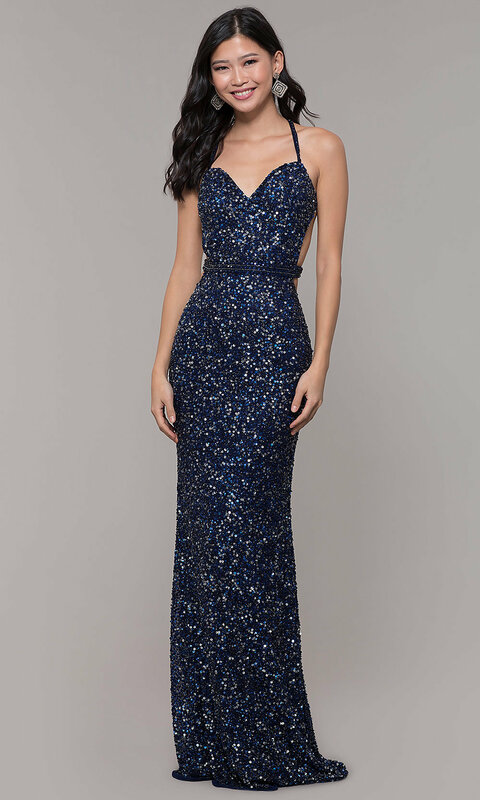 At under $250, this long formal dress by PromGirl dazzles for proms, galas, and other black-tie events. The model is 5'8.5" and wearing 5" heels.